kathryn d. terry - Phillips Murrah P.C. The emphasis of Kathryn D. Terry’s litigation practice is in the areas of insurance coverage, labor and employment law and civil rights defense. She also represents corporations in complex litigation matters. After 30 years of service to her sorority, one Alpha Phi alumna is being recognized by her peers. Director Kathryn D. Terry will be honored at the Greater Oklahoma City Alumnae Panhellenic Association’s Women of the Year luncheon on April 3. The annual fundraising event recognizes one extraordinary, local alumna member from each of the eighteen alumnae member sororities in Oklahoma City, said Kathleen Stevenson, President of the Greater Oklahoma City Alumnae Panhellenic Association. Terry’s history with the sorority dates back to 1989 when she first pledged. She is currently President of the House Corporation Board which manages sorority house operations—including managing all staff, food service, maintenance and improvements—to support active members. “I love working with smart, talented women in Alpha Phi and here in Oklahoma City,” Terry said. “I have made close friendships with successful women all over the country and right here in Oklahoma that I never would have known. Terry’s legal practice has allowed her the opportunity to provide training to other house boards and house directors for Alpha Phis across the country on issues related to both employment law and insurance coverage, further fueling her commitment to the organization. The Greater Oklahoma City Alumnae Panhellenic Association is a 501(c)(3) comprised of alumnae sorority members from the metro area dedicated to encouraging higher education for young women and promoting the ideals of scholarship, leadership and service which Panhellenic women have embodied for over one hundred years. All net proceeds from the luncheon support scholarships for graduating seniors from area high schools planning on attending Oklahoma colleges or universities, Stevenson said. “In 2018, we were able to award fourteen $1,500 scholarships to outstanding high school senior women from the greater Oklahoma City area,” she said. “Over the past 21 years, we have awarded over $310,000 in scholarships. For more information about the Greater Oklahoma City Alumnae Panhellenic Association and scholarship opportunities, please visit the website here. Gavel to Gavel appears in The Journal Record. This column was originally published in The Journal Record on May 10, 2018. The Americans with Disabilities Act prohibits discrimination against people with disabilities in several areas, including employment, transportation, public accommodations, communications, and access to government programs and services. The third section of ADA, Title III, addresses places of public accommodation, such as retailers, hospitals and state agencies. Under these rules, and in general, places of business are obligated to provide access to physical locations in the form of wheelchair ramps, signs that feature braille, and other means by which patronage of businesses is made possible for disabled persons. Currently, similar attention is being focused on websites, as many businesses offer information and opportunities and conduct commerce via their website. Lawsuits are being brought claiming that these websites should be fully usable for persons with disabilities, just like brick-and-mortar locations. To address Title III compliance, the World Wide Web Consortium developed an evolving set of standardized guidelines for improving accessibility to website content. The most recent, widely accepted version is called Web Content Accessibility Guidelines 2.0 AA, commonly referred to as WCAG 2.0 AA, which recommend, among many suggestions, text alternatives to graphics for visual disabilities, and captions to audio for those with hearing impairments. Within the past few years, growing exponentially in 2017, lawsuits on behalf of disabled persons have been filed claiming website-related violations of ADA Title III. Recently, the lawsuits have been coming in waves, with online retailers being the first obvious targets, followed by online financial institutions, such as banks and credit unions, both large and small. While there are no laws mandating WCAG 2.0 AA compliance at this time, the absence of any regulatory requirement does not shield businesses from ADA liability under Title III. Most businesses that have more than 15 full-time employees are subject to the ADA, and even if a business has less than 15, Oklahoma’s state law still applies. However, in Oklahoma, there is a new statute that requires prior notice and an opportunity to cure the website issues in advance of any litigation under state law only. Businesses should consider this statute carefully if they receive a demand or lawsuit. Many businesses are smartly getting ahead of this issue by reviewing their websites to identify potential accessibility barriers and implementing WCAG 2.0 AA guidelines as part of regular IT upgrades. Kathryn D. Terry is a director at the law firm of Phillips Murrah. 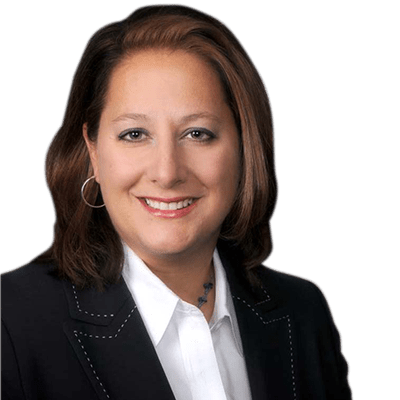 The emphasis of Kathryn D. Terry’s litigation practice is in the areas of insurance coverage, labor and employment law and civil rights defense. Q: What is sexual harassment? A: The word “harassment” gets thrown around and used in a lot of contexts. or employment law purposes, unlawful sexual harassment is conduct in a work-related environment that reasonable persons would characterize as offensive and sexual in nature, which actually offends a person and can be said to affect the terms of conditions of the sufferer’s employment. Q: What does “work-related” mean? A: First, unlawful sexual harassment doesn’t just occur at work or work events. In fact, more often than not, harassment takes place outside the office and after hours. All of the following are common: one co-worker shows up on the doorstep of another, uninvited and unwelcome; after work drinks; work-related texts that turn personal. If the relationship is primarily work-related and a problem develops, it could be an issue for the employer. Secondly, the employer must actually be an “employer.” Today, almost every employer engages independent contractors and consultants — people who are not employees. If one or both of the persons involved aren’t actually employees, while the conduct at issue may be offensive, even reprehensible or unlawful, it may not be sexual harassment. For example, if an employee makes unwelcome and offensive advances to a courier or caterer who isn’t an employee but interacts with the company and its personnel, that isn’t technically sexual harassment for employment law purposes. Incidentally, although an employer in this situation may not be required to address the situation, it should. If another instance occurs, the first incident likely would demonstrate the employer had notice of bad conduct by the employee but took no remedial action. Q: How offensive is offensive? A: First, the proverbial “reasonable person” has to be offended. What offends someone in Oklahoma may be commonplace elsewhere. Every joke, or even every proposition, isn’t necessarily harassment. If a co-worker invites another co-worker out to dinner, the second declines and that’s the end of story, that exchange is not very likely to be characterized as sexual harassment here in middle-America, regardless of whether the invitee was actually offended by the invitation. Second, actual offense must occur. One co-worker could make routine, crude, offensive, sexual remarks toward a specific co-worker. However, if those remarks aren’t offensive to the recipient (he or she takes them, rightfully so, as jokes), there’s no sexual harassment, no matter how vulgar the remarks may be. There are important caveats to be considered, however. Oftentimes persons who complain about long-standing harassment say they went along with the behavior hoping it would stop, fearing retaliation or thinking it was a joke and then it turned more serious. Thus, if a situation like this develops in the workplace, a prudent employer not only will inquire of the persons involved as to their comfort levels, but also will direct the employees involved, regardless of their congenial relationship, to tone it down and be respectful not only of each other, but also of other co-workers who are present. Q: How bad does sexual harassment have to be to be deemed harassment? A: The buzzwords are that is has to adversely affect the “terms and conditions” of employment; it has to make the sufferer’s job worse in a meaningful way. But, for example, repeatedly asking out a co-worker despite being rebuffed and asked to cease the invitations, probably can be considered harassment. Moreover, as recent news events demonstrate, one severe incident can be very significant harassment. Conversely, little and subtle remarks and conduct over time can be detrimental to a person’s employment environment and an employer who knows of this type of conduct but fails to take action does so at its peril. A couple of major red flags also exist. If the employee alleging harassment also suffers an adverse economic impact (for example, demotion, reassignment or failure to give a bonus) or if there’s any kind of physical contact (even an unwelcome hug), very careful scrutiny of the events and the relationship is warranted. 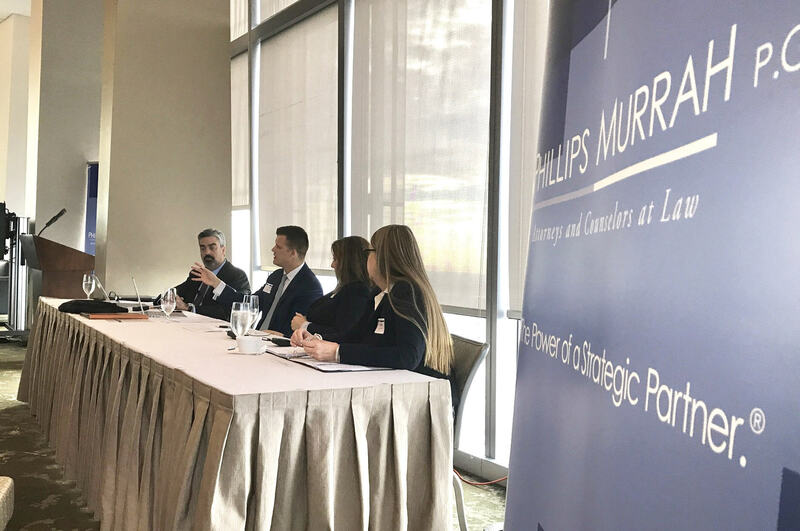 On Tuesday, Aug. 22, Phillips Murrah hosted a technology-related panel discussion called “Real Risks in the Virtual World,” as a part of their AM@PM Breakfast Forum series. The panel was moderated by Director Juston R. Givens. 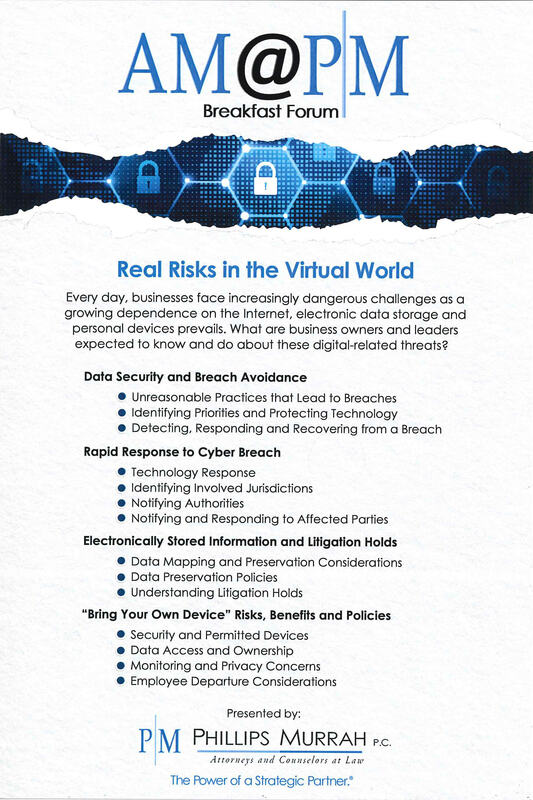 Director and Phillips Murrah CIO Fred A. Leibrock discussed data security and breach avoidance practices. 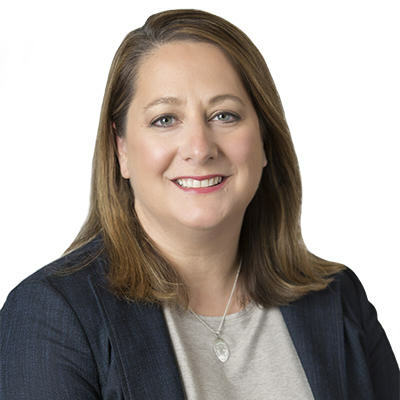 Director Kathryn D. Terry offered real-world, rapid-response lessons from having represented a client that fell victim to a large-scale phishing scam. Patent Attorney Cody J. Cooper discussed data mapping and preservation considerations related to litigation holds. Director Byrona J. Maule outlined risks and benefits for employers related to “bring your own device” policies. The well-attended panel discussion event was held at Vast on the 50th floor of the Devon Tower. 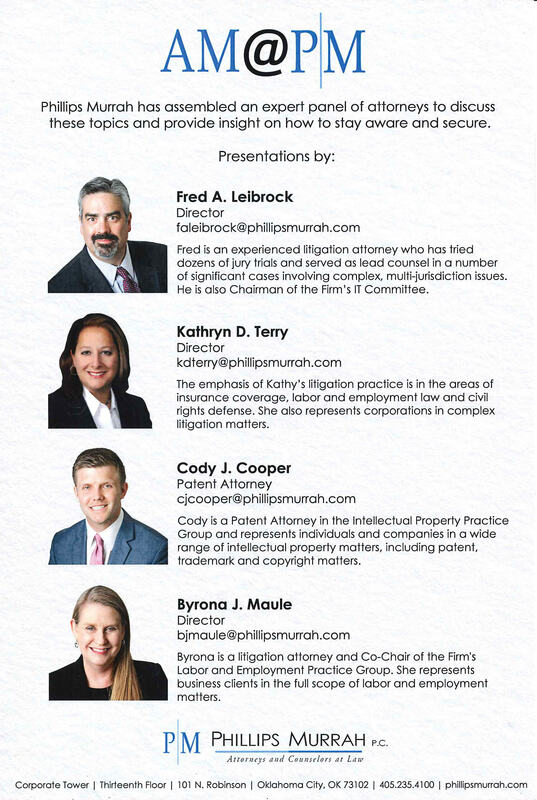 For more information about AM@PM Breakfast Forum, go to phillipsmurrah.com/AM-at-PM. Q: What are personal electronic devices and why do they matter? A: The use of personal electronic devices (PEDs) in the workplace is commonplace, but it’s not without risk for both the employer and the employee. If not managed properly, employers risk the dissemination of their confidential information and employees, perhaps rightly, have privacy concerns. Q: What can an employer do to protect its business information? A: Employers need a written PED, or bring your own device policy, signed by employees. Your policy should address several matters: the employer’s information always belongs to the employer; upon termination, it must be deleted immediately in the presence of the employer’s representative; all communications that go through the employer’s server are fair game for the employer and the employee has no expectation of privacy in those communications; only approved websites can be accessed via the employer’s server and accessing an unapproved website may result in severing of the server access and/or deletion of data, even the employee’s personal data, from the phone electronically; and the company always should have access to/be informed of the employee’s password for connectivity between the company server and the PED. Q: So personal data, including contact lists, phone numbers and pictures, can be deleted from the employee’s own phone? A: Yes, though this area is evolving almost daily nationwide. There are lots of different federal laws and statutes in every state, including common law, which could be implicated. Please consult an attorney before charging ahead. Large companies are moving toward policies that give advance notice to an employee that upon termination if he/she fails to cooperate in the deletion of company information, the company can and will wipe all data from the phone (or other PED) and return it to factory settings. Most of the recent case law out there comes down in favor of the employer and rejects claims by employees under various federal laws, like the Electronic Communications Privacy Act or the Computer Fraud and Abuse Act. Q: Don’t employees have a right to privacy in their own communications, on their own phones? A: So far, there’s no case out there that has found an employer can’t, under any circumstances, search a PED for data. Courts looking at whether a private employer has overstepped by searching PED communications do emphasize privacy concerns and they recognize each case is fact specific. But, typically, if that data is coming through a company server, the company can take a look. We recommend the employer narrow any such search to work related/topic specific communications. Q: Are the rules the same for government employers? A: Not really. Governments have to worry about the Fourth Amendment, unreasonable searches and seizures, and more often than private employers, union contracts. So far, most court and administrative rulings favor the government employer who searches a PED, but those cases get close factual scrutiny. Also, in the case of public employees (elected officials included), the Freedom of Information Act and, here in Oklahoma, the Open Records Act, are applicable. Work-related communications, even on a PED, are public records. If a government employer needs to search for and retrieve communications that are work related from a PED, that search is going to be permissible. Q: What about quality of life and working after hours? A: If your employees aren’t overtime exempt, after-hours texting and emailing should be included in the employees’ time records, and they should be paid for it, even if it results in overtime pay at a higher rate. Employers concerned about the increased wage expenditures should consider limiting PEDs use to only overtime-exempt employees. If this isn’t possible, a policy should be written and adhered to that results in very limited after-hours communications, and includes clear guidelines on how to account for the time and resulting compensation when those communications do occur. Q: Do we have to reimburse employees if they use PEDs for work? A: In some states, the answer is yes. Here in Oklahoma, we don’t have a bright line rule requiring reimbursement for an employee who uses a PED to conduct work-related tasks. However, many Oklahoma employers are moving toward reimbursement, or partial reimbursement at minimum. Q: What about litigation holds on electronic data that may be discoverable? A: If you’ve ever had to produce electronic data during the course of a lawsuit, you know that can be very burdensome. You also know that if you’re on notice of a potential claim against your company, you will need to be sure the company has policies and practices in place that work to preserve potentially discoverable documents, communications and data. Certainly, if your company’s employees are communicating and working on PEDs, there needs to be a process in place designed to reasonably capture and preserve that information, communication and data that may be stored or saved to PEDs, as opposed to a company network server. Director Kathryn D. Terry rejoined her sorority sisters for the Alpha Phi 71st Biennial Convention from June 22-26 in Cleveland, Ohio. Terry, who serves as President of the board for the Alpha Phi house association at the University of Oklahoma, offered her guidance by speaking to the more than 400 Alpha Phi women from across the country who attended the convention. “Sorority houses are happening places and face incredibly unique labor, employment and risk management issues,” Terry said. “As a labor and insurance attorney, and President of the house board, my professional life and Alpha Phi meet at a crossroad. Alpha Phi International is a sisterhood with chapters at 170 college and universities in the United States and Canada. Director Kathryn D. Terry participated in ALFA International’s EPL & Professional Liability Practice Group Seminar from June 8-10 in New York City covering issues related to insurance matters. “The panel discussed the impact of punitive damage verdict in employment practices litigation, including developing and potential issues related to insurance coverage for extra-contractual losses and the duty of good faith and fair dealing attendant to such coverage and potential coverage,” Terry said. ALFA International is a global network of law firms committed to providing high-quality, cost-efficient legal services worldwide to the network’s diverse clients. For more information on the seminar, visit the seminar’s website here. Director Kathryn D. Terry spoke at the Oklahoma Municipal Court Clerks Association‘s annual conference on May 17 at Oklahoma State University. Terry addressed issues on dress code dilemmas in the 21st century workplace, employee accountability, and conflict avoidance.